GOLES (Good Old Lower East Side) is a neighborhood housing and preservation organization that has served the Lower East Side of Manhattan since 1977. We serve the residents living south of 14th Street, East of 4th Avenue and the Bowery and down to the Brooklyn Bridge. Our catchment area corresponds with Manhattan’s Community Board 3. Ensure a clean and healthy environment where people live, work, and play. GOLES organizes residents of the Lower East Side around a wide range of issues. Each issue area that we focus on has a member-led Steering Committee that helps drive campaigns and programs. Our issue areas include rent regulated housing, public housing, land use, environmental resiliency and disaster recovery, healthy aging, and youth. 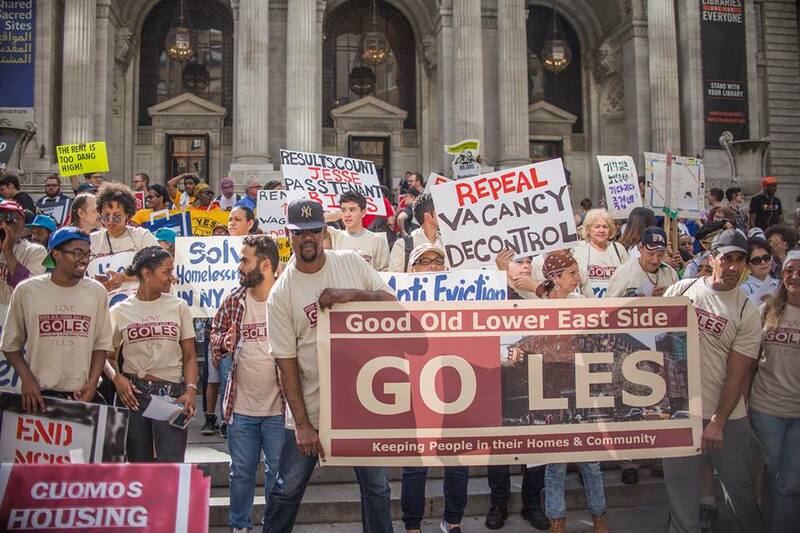 All Lower East Side residents are eligible to join GOLES, especially those living in rent-controlled, rent-stabilized, Section 8, public, or other subsidized housing. GOLES members are part of a network of neighborhood stewards, community leaders, and people who care about the Lower East Side. Membership dues are $10 dollars a year and $5 for youth and seniors. Members can join any of the “Steering Committees” to have a say on GOLES’ campaigns and projects on issues such as Public Housing, Land Use, Environmental Justice, and more. Other ways of getting involved with GOLES are donating, volunteering, or interning. The GOLES Youth Council is a collective of NYCHA residents ages 16-23 who organize around a NYCHA policy titled Permanent Exclusion (PE). As a result of this policy, NYCHA evicts residents who are arrested for violent crimes. Members of the Youth Council have participated in a leadership academy training series, conducted neighborhood outreach, compiled surveys to assess the impact of PE on public housing residents, organized social justice movie nights, participated in marches, and organized a performance and music event. GOLES Healthy Aging Program (GHAP) is a preventative healthcare initiative for seniors that combines direct service with community engagement and leadership development. GHAP addresses the immediate health and social service needs of low-income Lower East Side residents, age 50 and above, including physical, mental, social, and financial well-being. The program offers counseling, information and referrals, community workshops, and community engagement activities. As part of the support provided to LES seniors, GOLES offers a variety of supportive services, such as Medicare Savings Program enrollment and recertification, SNAP application and recertification, and assistance with simple tax forms. For more information about the GHAP Program or about our supportive services, please contact Maisha Morales at maisha@goles.org. GOLES offers internships to individuals who are interested in community organizing or want to fight for their community. Interns help with research, door-knocking, campaign strategy, phone banking, and administrative tasks. If you are interested in internships at GOLES, fill out an Internship Application. GOLES welcomes volunteers of all ages. Volunteers assist in various aspects of work, such as conducting outreach, helping prepare for actions, and providing administrative support. To find out more about volunteering, please complete the volunteer application form.